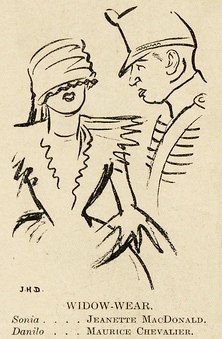 The original Punch illustration for the film. The Merry Widow is a shallow masterpiece. Sonia (Jeanette MacDonald), the richest woman in Warshovia has been widowed, might be hooked by a foreigner and send the country’s economy into a tailspin. Danilo (Maurice Chevalier) gets caught by the King (George Barbier) making love to his wife and the Queen (Una Merkel) is so complimentary that he is chosen to be the one to woo and win The Merry Widow back to Marshovia. It’s a film full of delights; the magnifying glass over the map that introduces us to Marshovia (figure 1), the first meeting between Danilo and the Widow which begins by her reading the letter saying he’s terrific and ends with him following her to the palace and saying ‘I tried to bring a little moonlight into your life…..Forget me – if you can!…and Don’t include me, even in your dreams!’; The montage of black veils, shoes, corsets and dogs that signify her life and whose change in colour symbolises a decision to change that life; How the King discovers his wife is cheating on him — a scene that Billy Wilder used as an exercise with students at UCLA asking them how would they stage it and then showing how Lubitsch did it; the fabulous waltz sequence, with hundreds of dancers waltzing through a palatial hall of mirrors, a still from which illustrated countless early film books (see fig. 1); the charming prison sequence at the end; Sam Raphaelson’s witty dialogue. The film is a delight, a joy, a mini-masterpiece of cinematic inventiveness. Barbier and Edward Everett Horton, as the Marshovian Ambassador to France, are particularly enchanting. It’s only of Lubitsch that one dares ask for more. The film was based on Franz Léhar’s operetta and was remade by Curtis Bernhardt in 1952. I quite like the Bernhardt version with Lana Turner and Fernando Lamas but to see the two films side by side is to be convinced of Lubitsch’s genius. Both films were for MGM, the Lubitsch version, the most expensive film made to that point and, though a considerable hit, it still lost money. Figure 1: The magnifying glass over Warshovia. N. T. Binh and Christian Viviani have called The Merry Widow the quintessential Lubitsch film (Lubitsch, T. &B Editores: Madrid 1991, 2005, p. 160). It contains the elements of spectacle evident in his early silent (from Carmen onwards), the operetta form of his early thirties musicals (e.g. The Smiling Lieutenant) — hugely popular then and unjustly marginalised in historical accounts of the musical genre now — the rhythmic elements evident in all of his great works (note the dance number in the silent The Oyster Princess from as early as 1919), the use of doors, the indirect way of showing, the ingeniousness and comedy that infuses the whole film, the sophisticated comedy of manners of his greatest films (Trouble in Paradise), the great dialogue of most of his great talkies (Ninotchka), the controlled, precise, and poetic imagery of is late masterpieces (the letterbox sequence from The Shop Around The Corner say). One can’t help but agree. The Merry Widow might not be the best Lubitsch – it doesn’t quite touch our hearts – but it is the quintessential Lubitsch in that it delights the eye, the ear and the mind. 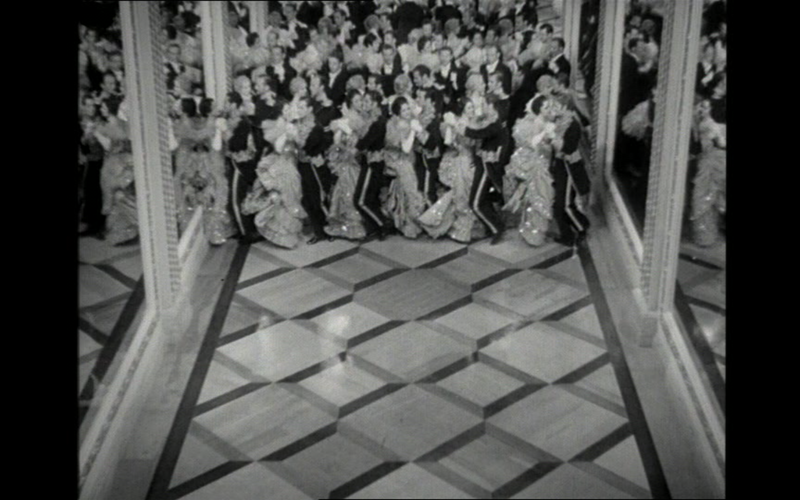 Figure 2: Classic imagery from celebrated waltz sequence.